…..I saved some stems from last year and hope to make a few this year. Or maybe I could duplicate this felted wool pillow that I purchased from a craft show long ago…. I truly love this season of pumpkins and wonderful tones of oranges and browns. 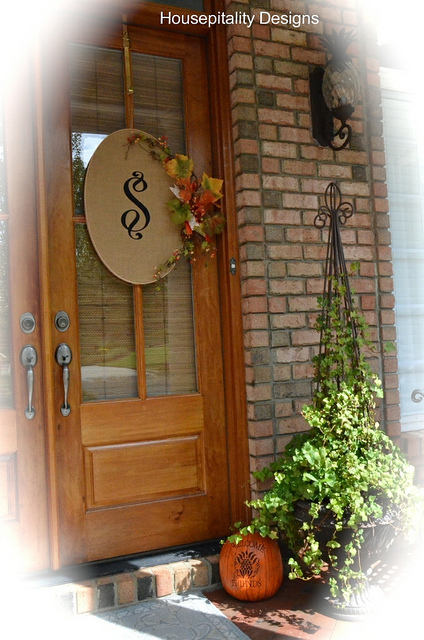 And fall wreaths and pumpkins welcoming friends and family. 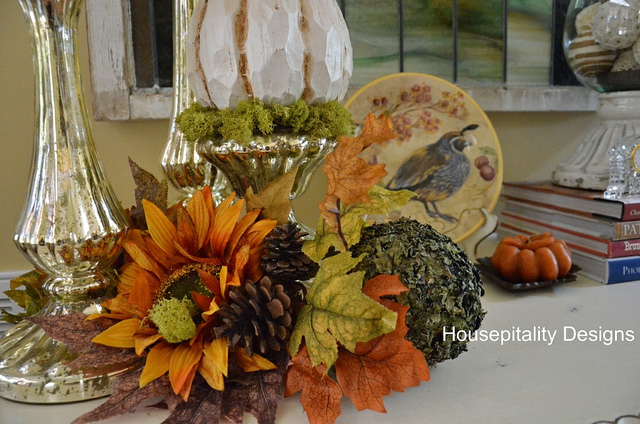 I just took out the boxes of Fall decor from the attic and hope to create a garland..
…..out of these pretty stems that I purchased last year to make this centerpiece. And need to help plan a special birthday party for my mom, who will be 88 in November..
…..it’s a surprise. 88..a great year…”double infinity”. 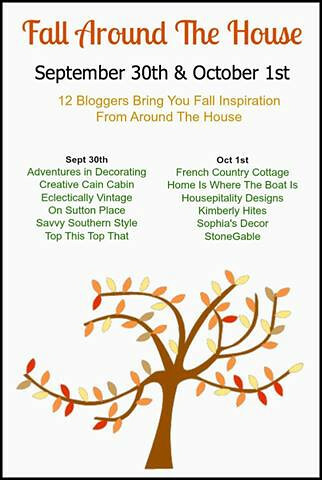 You will get some great inspiration from this great Fall Party starting September 30th. 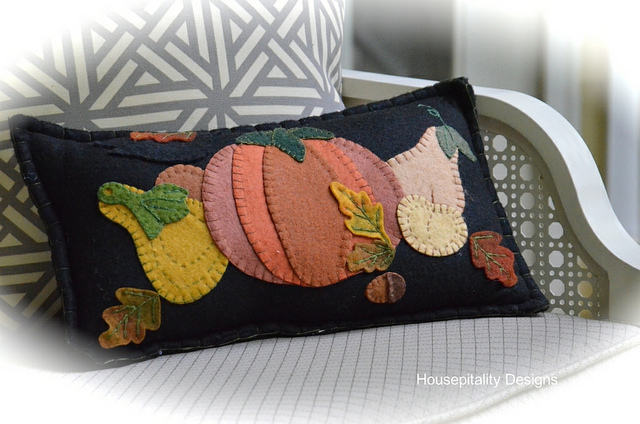 Love your velvet pumpkins and pillow Shirley! Hope you found some beaux trésors in France! Beautiful Fall tidbits, Shirley. I can’t wait to hear about your trip. 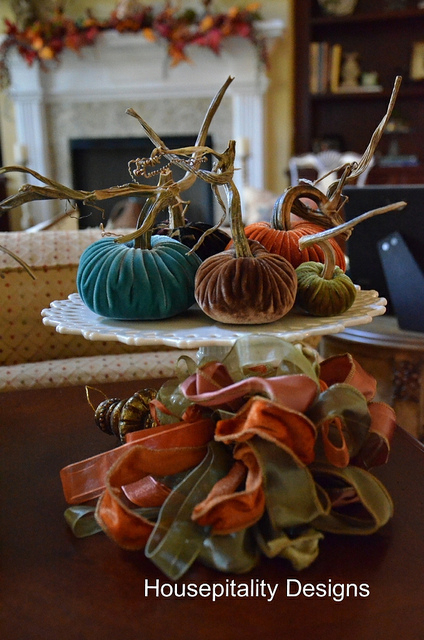 Love the little Fall tidbits…those velvet pumpkins are gorgeous! Anne@DesignDreams’s recent post…Home Made Frying Pan Gingerbread Granola – Easy Peasy!!! I have special idea for your Mom’s birthday……at 88 I am sure there are loys of relatives and descendants…..send them all a page of a book and tell them to write, draw, create “what I Love about (insert name). Bind the pages all up and give as the birthday gift. My daughter did this for me and I treasure it. Secondly, ask your Mother to select things that she wants to pass on. Have her give them at the birthday so she can treasure the pleasure of the recipients. I’m assuming she is as generous and loving as my MIL who did this…….good luck! Shirley always amazing. Have a safe trip home and I can’t wait to hear about France and see your treasures. I saw one on FB today. Lucky girl!!! I bet France will never be the same! You ladies must be having a blast, I’m so jealous! Safe trip back and we all can’t wait to see the treasures you bring back. Lucky gal you’re in France! I look forward to seeing pictures and the inspiration you bring back with you. I love that pillow that you found at a craft fair… I would love to see you make one and I hope you include a how to along with it. Great ideas as always… and full of inspiration! I know you’re having fun in France! What a fabulous experience! I love your velvet pumpkins! I need to try to make these. Thanks for the tip on saving stems for them. Your table looks so pretty! 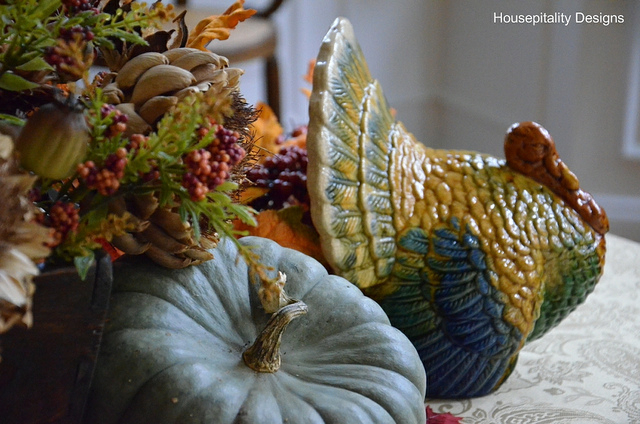 I love all your Fall vignettes! Can’t wait to hear more about your trip. I’m still trying to get over being envious! 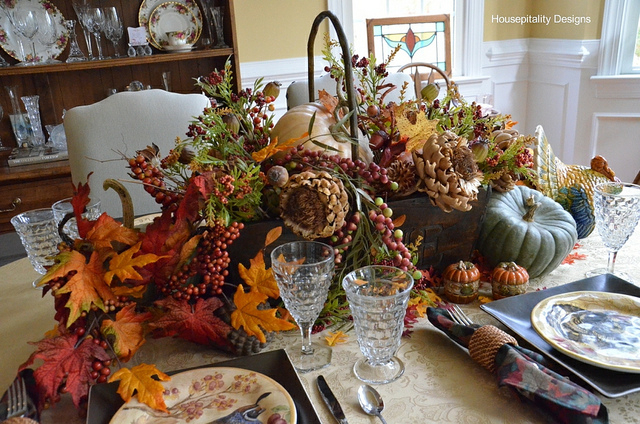 Beautiful Shirley… your dining room centerpiece is gorgeous! !